General G.3 Wire Super Strong Slim White Dry Portion Snus is the second in Swedish Matches new series of white dry portion snuses. G.3 Wire has the taste of red berries and tropical fruits, combined with 30% more nicotine and 20% less drip than G.3 Extra Strong Portion Snus. The snus creates a pleasant long-lasting burning effect, and a spicy and biting feeling under the lip. 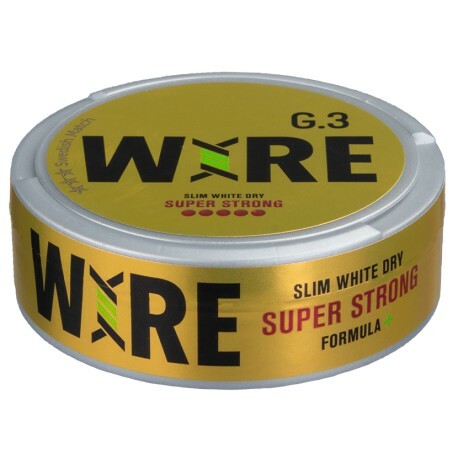 General G.3 Wire Super Strong Slim White Dry Portion Snus taste is very similar to the LaB 13 snus it is replacing. The nicotine comes on quickly and stays strong along with the flavor for quite some time. If you were a LaB 13 fan or enjoy energy drinks, this is a snus you need to try. A lovely snus experience. Plenty strong, light flavors of berry with plenty of tobacco coming through. Pleasant burn. I just ordered another roll, you should too. This is the snus equivalent of Red Bull, by taste and strength. Nice to have one can around but not and all day recommend. I had always wanted to try the lab version of this flavor, but never got around to ordering it so i cant compare to that. But as far as the flavor description it is spot on. That red berry energy drink flavor tastes exactly like the popular energy drink red bull. I dont drink energy drinks but i love the flavor. Fruity strong long lasting snus with minimal drip and slim discreet portions. This is another regular for me just because i enjoy the flavor so much. I wish i could get this with a little less nicotine but aside from that this snus is perfect! I've never had Lab 13 flavor +, but this is hands down the best snus I've had. I'm not really one for flavorings in my snus, generally sticking to tobacco flavor, but this is outstanding. Love the mild flavor and aroma, love how long it lasts. My only regret was that when ordering it for the first time, I only got one can.